Hey everybody, it's Truffles! Lately Mommy has been reading a lot about the benefits of coconut oil for both people and pets and decided to buy a jar for us. She was delighted to discover that I absolutely LOVE it! The only trouble is, it's so darn messy! She puts it on her fingers or a plate for me to lick off, and it ends up everywhere. She mixes it in with my food and it globs up in the corner. Then one night a couple months ago we were participating in a BlogPaws chat with Wellness, and we heard about a new treat with coconut oil inside! We were SO excited and could hardly wait for these treats to hit our store shelves. We waited, and we waited, and we couldn't find them anywhere. Then Chewy.com asked us to review them as part of their Blogger Outreach Program! Wellness believes in giving pets a colorful palette of the best nutrition possible, so they made TruFood with whole foods from farm, field and sea. 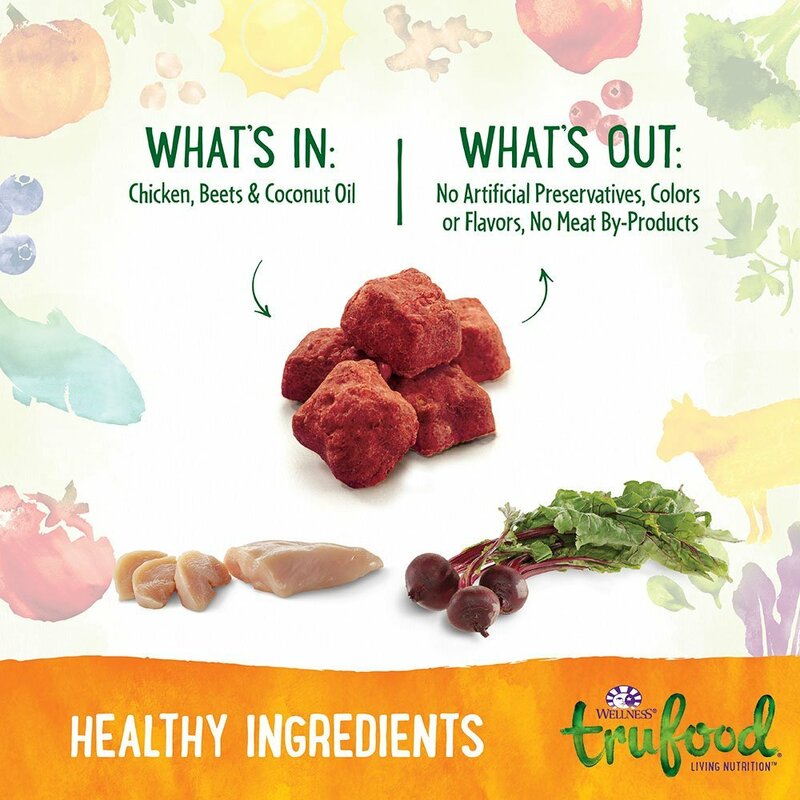 TruFood has more of what pets need to be vibrant and happy - that's how love becomes Wellness. 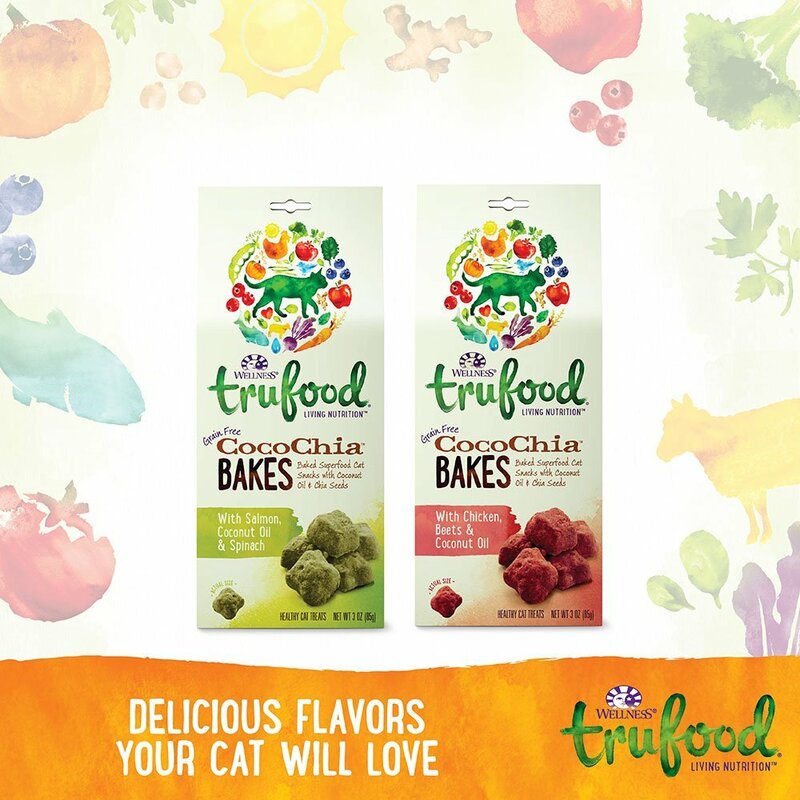 When you spoil them with chia seeds and whole-prey protein, your cat gets more than just a tasty treat. These TruFood CocoChia Bakes are packed with coconut oil and probiotics to support skin and coat and digestive health. Just when we thought all hope was lost for these treats, Mommy decided to try them on one more kitty...our neighbor T-Two, who she's cat sitting this week. And finally we hit the jackpot. She loved them. So out of three cats, only one liked these treats. In theory they're a really good idea, but there's just something about them that doesn't appeal to many cats. Do your cats like coconut oil? How do you give it to them without making a mess? We're reviewing these treats this week, too. Guess what? We didn't like them either. Truffle actually sniffed and walked away and she never does that with treats! Well we're enjoying hearing about the tastings anyway...glad the neighbor's cat had an unexpected feast. You guys have a good Thursday. That's too bad that you didn't like these treats. Usually Wellness gets paws up from everybuddy. Uh-oh......we have some of the chicken ones to try this weekend. 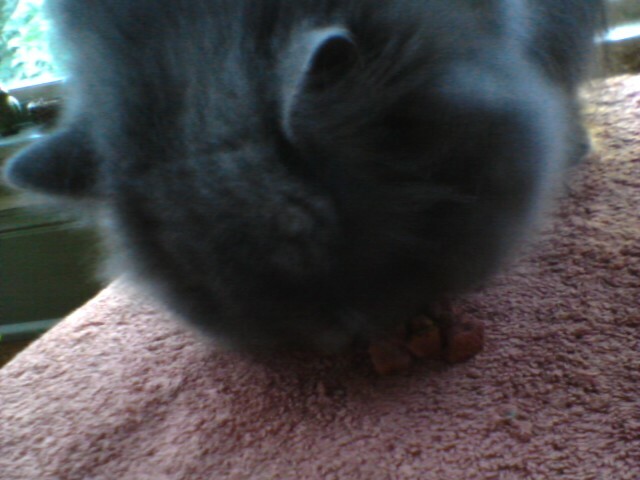 We expect that Lita will not like them because she is so picky - she likes very few treats. After reading this, I wonder if Carmine will try one or not. It will be interesting to see what he thinks! This is so interesting because a friend was just telling me about the various uses of coconut oil last night. She said that swishing some in your mouth can even whiten your teeth! I hate coconut oil. 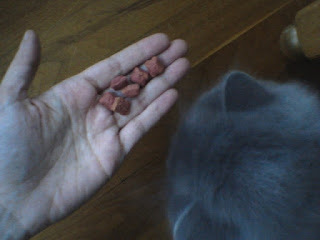 I never had these treats but usually I’ll eat any kibble but I wouldn’t eat the TruFood kibble. We're reviewing treats this week but we chose different ones. Mommy hopes we like them! Too bad you didn't like yours. Mommy thought about giving us coconut oil, but isn't sure what the best way to do it is. If you figure something out we'd love to hear about it.